I purchased this vintage Delta 34-500 8" Table Saw at a garage sale for $50. It was covered in dirt and grime but mostly complete. It included the original Delta motor, aluminum pulley guard, fence, and miter gauge. After a good cleaning and tune up, it worked exceptionally well. I am finally retiring my Delta Homecraft 34-500 table saw which I purchased from a friend for $50.00. I've used this machine for over 25 years and it is still working well. I just received a Delta 36-725 from my wife for my birthday. I guess my Boice Crane 4" jointer is next. I guess my Boice Crane jointer is next. I recently restored I believe is a Delta Homecraft 34-500 8 in table saw, combo. It is a table saw, tip up Drill Press, 4 in Jointer on the side, and a 8 in Disc Sander. My Combo is currently on Vintage Machines.org. All these accessories are run off of one 1/2 HP motor with a long belt for the Drill Press, belt for the Table saw, and a pulley on the other end of the motor to run the Jointer. A really cool combo. I have been told this is from the 1950-60's era and was Delta's attempt to compete with the ShopSmith, but as we know today, Delta's attempt did not fair to well. I love and restore these wonderful old machines. is it for sale again? I just got it for $25 at auction it is in good shape. I would like to get a parts listing and manual/s for them. Can anyone point me in right direction. 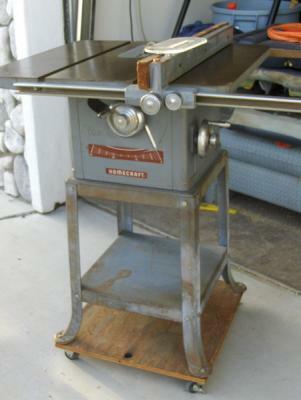 I want to sell this vintage saw! Could you tell me what it's worth?